So I got a free not-intended-to-be-free set from the Sims 3 Store today. 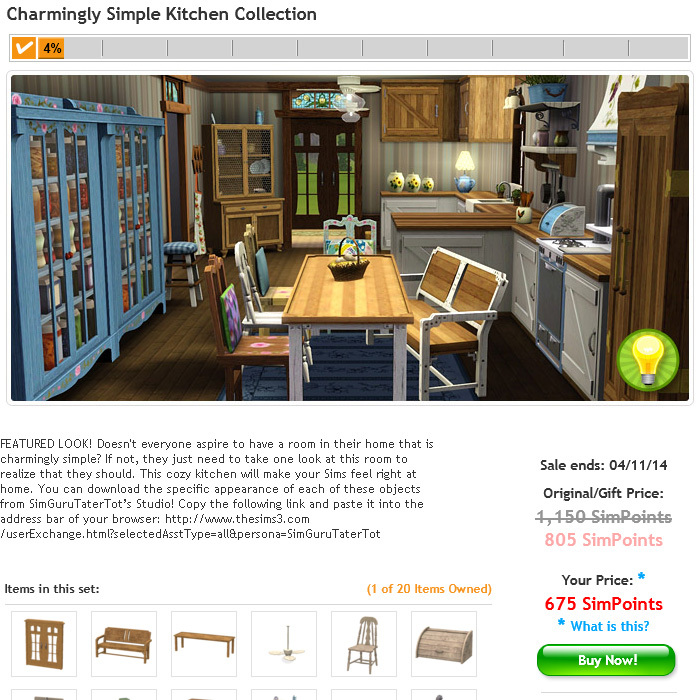 The Complete Your Set “function” in the Sims 3 Store (details here) gives you a discount for already owning parts of a set. The bar at the top is how many items of the set you already have. 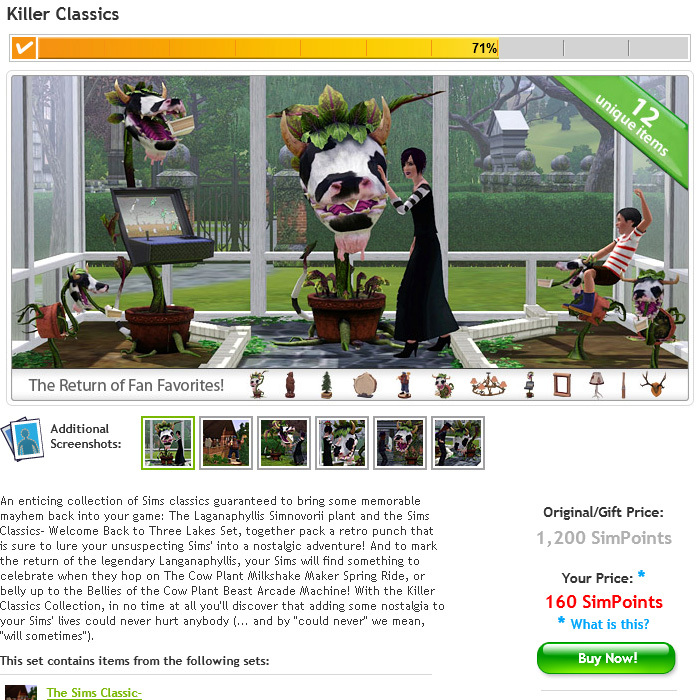 The two items in the Killer Classic set which I don’t already own cost 200 SimPoints each. Or I can pay 160 SimPoints for both only if I purchase it from the set page. Today, I was randomly clicking around after checking out the Daily Deal, and I came across the January 2012 Compilation, and there was – very oddly – a Download option instead of the usual Buy Now!. I thought it was a bug. Slightly nervous and worried over losing my 1,090 SimPoints, I clicked it. And it just gave the set to me, which is great, because it has the Cowplant! Free! I kid you not. I can’t quite recall, but I seem to remember that I was at ~53% completion for the set, from items given out last Christmas and stuff I had bought on Daily Deal. Clearly, I had to check out if there were any other sets I could get for free. I came up with two methods. The first didn’t turn out so well, and I’ll tell it to you at the end of this post so you don’t decide to try it. My suggestion is that you can go through the list of sets and check them one by one. This is just a matter of opening a lot of tabs and guarantees that you’ll check every last set. The “Premium Sets” list are all listed elsewhere, so you can skip that list. And check out the compilations last. If you do get free sets or decide to purchase one, the compilation might be given for free. The Complete Your Set discount stacks with any ongoing sales, for both discounts. If there’s a sale on, the set might even be free. Remember to re-check any sets when they’re listed on the sale page! It’s also worth checking before you make any purchase (even Daily Deals) if the item you are about to purchase belongs to any sets. I seem to recall spending a lot of SimPoints on the Book of Spells, and I can’t help thinking that I might have gotten it for less with this discount (but getting the Cowplant today is a nice consolation). Finally, while checking out Daily Deals/Make Me An Offer, go to the individual items page and check out the sets. You might be able to get a set for free by purchasing a Daily Deal. Check out my free haul during a store-wide sale! This is the first method I came up with for looking for free sets. I went to my Purchase History, opened each item into a new tab and scrolled down to see if it’s part of a set. If it is, view that set and see if it’s free. 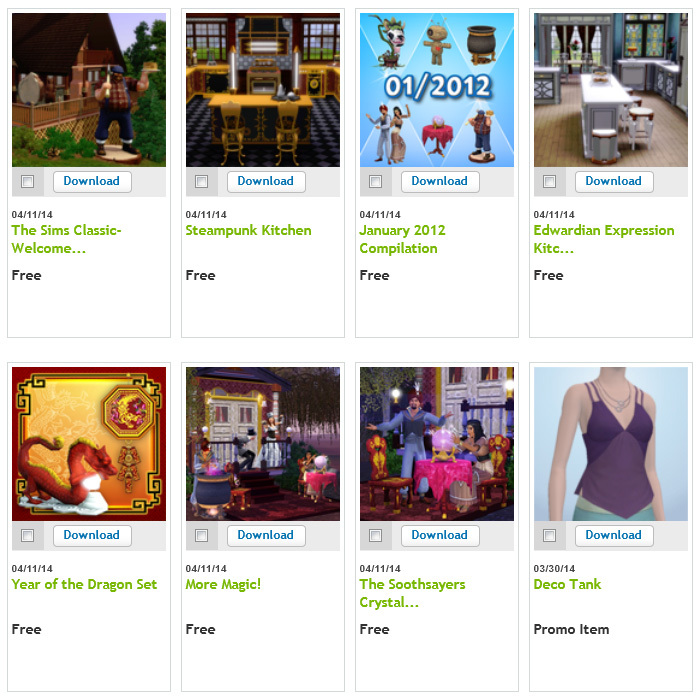 I only checked the items that aren’t Free Sims 3 Store Items (note that some of the items in my purchase history are listed as “free” even though I had paid for them). The first problem is that, due to a bug with the page, some items might not be clickable. I had to copy the name and use the search function. The second is that items in a set might belong to other sets, so you’ll also have to check each individual item in each set that you own. The third problem is that some items displayed did not list the sets that they’re a part of, which basically defeats the purpose of this exercise entirely.